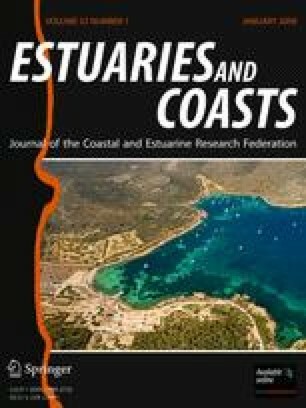 The distribution and intensity of hypoxia (low dissolved oxygen) in estuaries is increasing worldwide due to cultural eutrophication. This study quantifies the strength of associations between the duration of diel-cycling severe hypoxia (≤2 mg O2 l−1) in bottom water (∼15 cm above bottom) of a shallow (<2 m) coastal lagoon estuary (Delaware, USA) and abiotic environmental variables (water temperature, insolation, tide, streamflow, and wind) and predicts the duration of severe hypoxia given different combinations of these variables. The intensity and spatial extent and dynamics of diel-cycling severe hypoxia events were defined. Vertical variability in dissolved oxygen (DO) concentration during the daytime was also determined. During the summers of 2001–2005, bottom DO data were collected for periods of weeks to months at multiple sites using automated sondes. Multiple linear regression (MLR) and regression tree analysis (RTA) were used to determine the relative importance of the environmental variables in predicting the number of hours of severe hypoxia per day. Key findings of the study were that severe hypoxia events of minutes to hours in duration occurred frequently in all four tributaries sampled, primarily between 0200 and 1000 hours. Severe hypoxia duration and diel-cycling amplitudes of DO concentration increased in the up-tributary direction. Hierarchically, the duration of severe hypoxia was influenced mostly by the mean daily water temperature, then by preceding days’ total insolation, percentage of morning hours (02:00 to 10:00 a.m.) ebb tide, and daily streamflow. Collectively, the variables examined by the MLR and the RTA approaches accounted for 62% and 65% of the variability in the duration of severe hypoxia, respectively. RTA demonstrated that daily mean water temperature above 26.3°C and previous day’s total insolation below 13.6 kW m−2 were associated with the longest lasting severe hypoxic events (9.56 h). The environmental variables and combinations of conditions that modulate or augment diel-cycling hypoxia presented in this paper enhance understanding of this widespread and growing phenomenon and provide additional insight regarding the extent to which it can impact food webs in very shallow estuarine waters that often serve as nursery habitat. The authors thank S. Baker, R. Barber, S. Brown, N. Campbell, M. Crane, E. Dickey, S. Huerta, G. Mitchell, J. Nye, J. Rager, K. Ranck, M. Rhode, S. Schmidt, K. Stierhoff, and D. Tuzzolino for help in the field and M. Warner for use of the HOBO microstation data logger and photosynthetic light sensor. Funding was provided by the Center for the Inland Bays under United States Environmental Protection Agency grant number CE-99399002 to R.M. Tyler. This research was also supported by funding from the Delaware Sea Grant Program, NOAA, US Department of Commerce, under grant numbers NA16RG0162-03 (Project R/F-21) and NA03OAR4170011 (Project R/F-23) to T.E. Targett, and by NOAA, National Centers for Coastal Ocean Science, Center for Sponsored Coastal Ocean Research, through the Coastal Hypoxia Research Program (CHRP Award number NA05NOS4781199 to T.E. Targett, D.M. Di Toro, and R.J. Diaz). This is CHRP Contribution Number101.